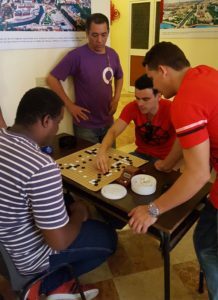 The Academia Cubana de Go will host an international go tournament in Havana September 14-16 and are encouraging US players to attend. Click here for details. I–Dared Travels, a provider of US to Cuba trip arrangements, has put together a travel package for this trip, which includes three days of mental challenge and cameraderie, as well as exploring Havana and its outskirts, including a visit to Finca Vijia, home of Ernest Hemingway. Participants will take part in five rounds of WGAC regulation games, and lodging will be provided by the Hotel Palco, an extension of the Convention Center of Havana. Registration closes August 31. Those interested should be sure to review US regulations governing travel to Cuba; Federal regulations are at 31 CFR 515.567.